So I need to make something like twenty slats for the new project. About 30″ long, about three-eighths of an inch thick, or roughly 750x10mm – in actual fact the measurements are specifically “from the top of the drawer box to the height of the mattress plus enough height so a six-month-old couldn’t reach up, grab the top and haul themselves out of the cot”, so metric vs imperial isn’t even all that useful, but such is the way of things if you make stuff to fit I guess. The average length of a six-month-old from toes to shoulders is around 44cm-ish btw, though that’s for the average and it varies by several cm in both directions – there are charts for this sort of thing but they’re not hugely useful, because they don’t have a chart of how high an obstacle determinedly self-destructive newborns can get over. I’m going for around 30cm/1′ from the top of the mattress, which gives me a slat length of around 28″ish when finished, so 30″ is a decent rough cut length. The plan for last weekend was to make one slat, which would almost be sacrificial as I’d be testing the process along the way, building jigs and figuring out what worked and what didn’t. So the starting point was a 30″ long, 8″ wide, 1″ thick board of nice ash. It’s that short wide one at the top of the pile nearest the camera there. 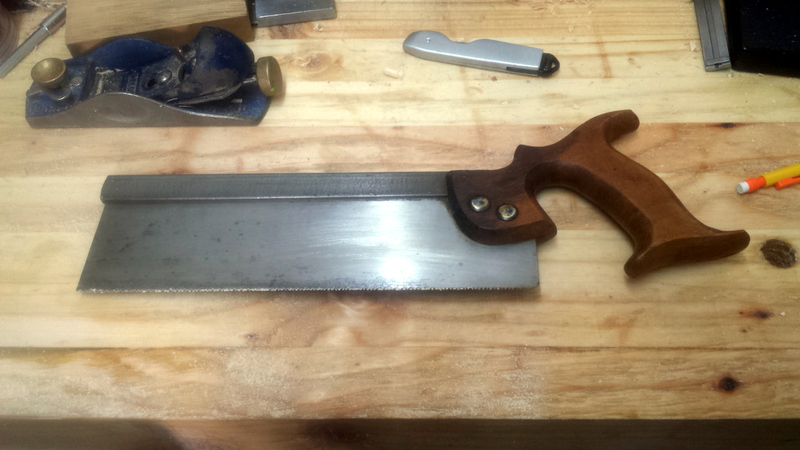 And that saw is where I started with the resawing. Japanese saws are fantastic at cutting through thin material or crosscutting – it whipped through those boards in that photo in nothing flat. But resawing is a pig of a job, you’re effectively cutting through thirty inches of eight-inch-thick board (which just happens to be an inch wide). It took all of Friday evening and half of Saturday morning to do that. And half-way through I switched from the Japanese saw to a western rip saw (I think it’s an old Disston, but it’s second-hand and the plate etch is long gone). I stopped to run a saw file over the teeth a few times as well before I started. And no, the western saw wasn’t better. In fact, it was terrible, but that’s because the plate had a bow in it that I didn’t notice at the start. I need to straighten that thing out before trying it again. 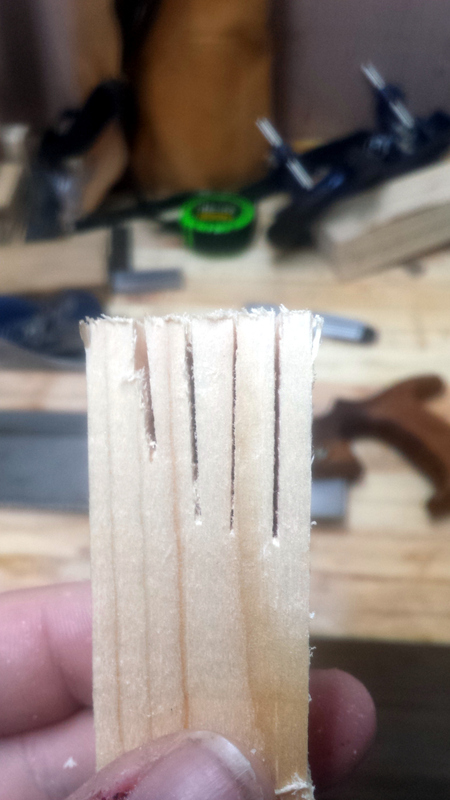 The next board I resaw, I’m going to rip to 2″ wide lengths first, then resaw each of those. 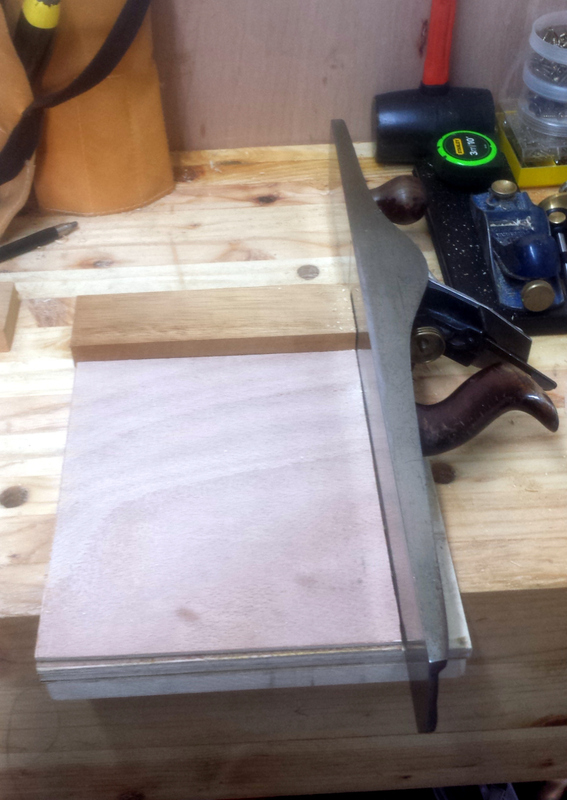 It’s more cutting, but I figure resawing a 2″ wide board will be easier than an 8″ wide one. I may even take photos – this time I was too busy sweating and swearing at the Disston. But eventually I got the board split, and the half resawn by the ryoba was nice and relatively clean; but the half done by the Disston was a messy disaster. Instead of two almost-half-inch boards, I had one that was just over ⅜” thick and one just over the half-inch mark. Lots of planing needed, so I will probably get four or five slats out of that board at most instead of the maximum possible of eight. I have two 30″ lengths cut and a 34″, and two more I can get out of the other 5′ long ash board I have, that gives me a maximum of forty slats I could make. The design says twenty are needed, but I want some room for wastage. The ash I have is set aside just for slats for right now; anything left over can get used for other things (I might make it into the drawer if I had enough). The frame is walnut, I have more than I need for that, and I have some poplar for the drawer, so I have enough material. The real risk is that I’m running low on swear words to use on the saw in the process and I might wind up repeating myself. It’s very simple in use – put slat blank in the middle, put plane on top, push back and forth until the plane no longer takes shavings (the thin slats on either side hold the plane off the work at that point). Optionally, flip the blank over half-way through process. 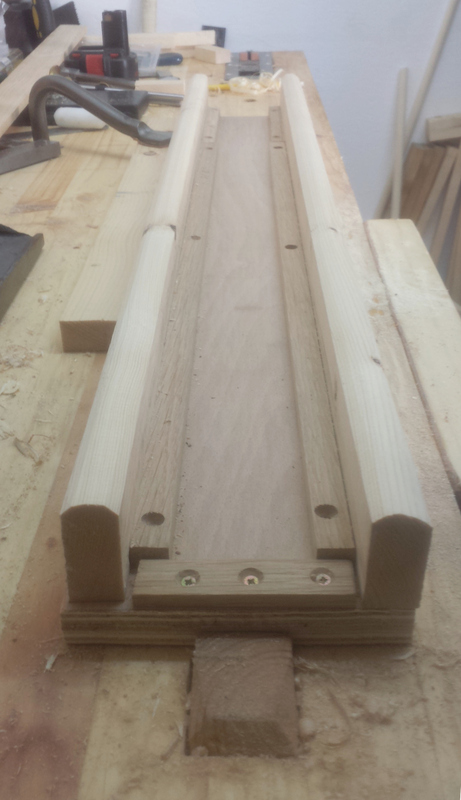 End result – one slat, planed to uniform thickness with the twenty others you’ve done. I think that part of the process we can say is solved at any rate. 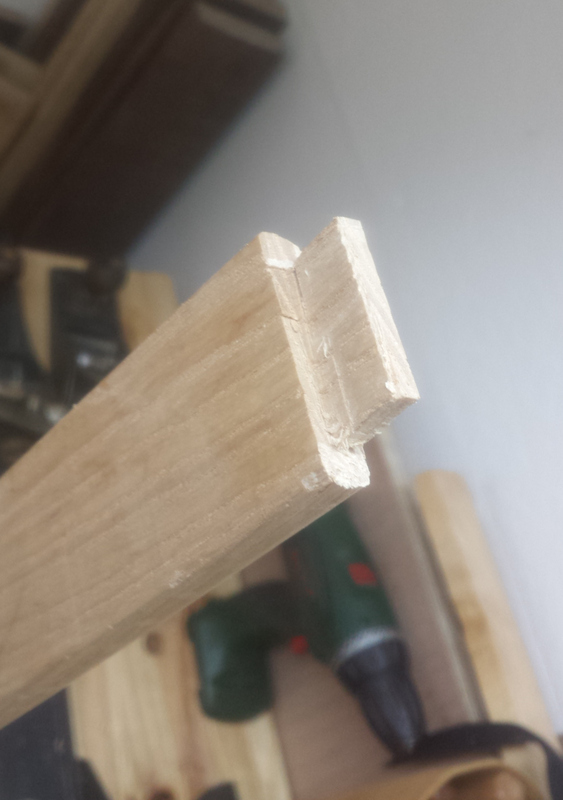 …and then cut a test tenon at the top to see how awkward that job was going to be. Answer: don’t do this on the day you resaw and plane everything, come at it fresh on a new day. It’s doable, but it requires finesse and I had none of that at all after the resawing. I’ll have to resharpen my chisels – and maybe even wait for the new old chisels I just bought to arrive as they’re more delicate ones intended for this sort of thing while the ones I have are designed to be big and beefy for chopping out holes in big-assed lumps of timber – and I also need to use my better saws for this job. From left to right that’s the oldest ryoba I have (on the ripping side, which is its worst facet, it’s far better on the crosscut side); the newly sharpened carcass saw; the dozuki saw; and the newer ryoba (the small new one, not the godzilla-killing thing I got for the bench). We have a definite winner in the dozuki for the role of dovetailing, but I think the test needs to be re-run.